The Winnipeg Jets continue their final road trip of the regular season tonight when they meet the Minnesota Wild at Xcel Energy Center…The Jets started the trip by defeating the Chicago Blackhawks 4-3 in overtime last night…Winnipeg continues the road trip Thursday against the Colorado Avalanche in their penultimate game of the regular season. The Jets have clinched their spot in the 2019 Stanley Cup Playoffs…It’s the first time in franchise history that the Jets have reached the playoffs in back-to-back seasons…Their magic number to clinch the Central Division is four, which would give the Jets their first division title since relocation…If the playoffs started today, the Jets would host the Dallas Stars, who hold the Western Conference’s first wild card spot, in the first round of the playoffs. Last night and tonight marks the last of nine back-to-back sets the Jets have this season…Winnipeg is 6-3-0 in the first game and 5-3-0 in the second game of back-to-backs this season…Last season, the Jets went 4-3-2 in the first game of nine back-to-backs and 4-4-1 in the second game. Winnipeg is 21-17-0 on the road this season, which has set a franchise record for most road wins in a season…The Jets have won three of their past four road games…Winnipeg hasn’t lost three consecutive road games in regulation since Dec. 10-20/16…Winnipeg is 15-for-17 (88.2%) on the penalty kill in its past six road games…The Jets have scored 33 goals in their past 10 road games…Blake Wheeler leads the Jets in scoring on the road this season with 38 points (10G, 28A) in 38 games…Patrik Laine leads the Jets with 19 goals on the road. The Jets are 13-11-0 against Central Division teams this season…Winnipeg is 4-6 in their past 10 games against Central Division teams…Since the start of the 2016-17 season, the Jets are 47-28-4 against Central Division teams, which is second in the NHL…In that same time frame, Blake Wheeler leads all NHLers in scoring against the Central Division with 97 points (28G, 69A) in 79 games, while Mark Scheifele is third with 89 points (36G, 53A) in 71 games. Dating back to Apr. 3/16, the Jets have won 13 consecutive regular season games in April…Nine of the 13 wins have been by one goal, including three in overtime and one in a shootout…The Jets are unbeaten in regulation in their past 21 regular season games in April, going 19-0-2 since Apr. 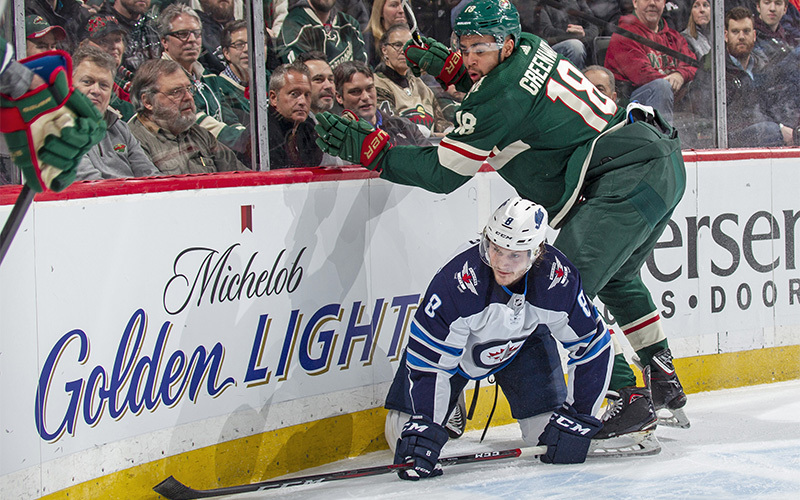 10/14…Blake Wheeler leads current Jets in career scoring in April with 50 points (22G, 28A) in 55 games, while Mark Scheifele is averaging nearly a point per game with 17 points (6G, 11A) in 18 games. The Jets registered 38 shots last night, which is the second most in their past 24 games…It was the first time in four games that the Jets outshot their opponent…Fourteen of the 18 skaters that played for the Jets last night had a shot, led by Nikolaj Ehlers, Patrik Laine, and Jack Roslovic, who had five shots each. The Jets’ third and fourth lines have scored their past seven even-strength goals (excluding Kevin Hayes’ overtime winner) and have accounted for all the even-strength goals the Jets have scored in their past three games…Jack Roslovic scored twice last night and had an assist on Saturday against Montreal for three points in his past two games. Blake Wheeler has 69 assists this season, which ties Marc Savard’s franchise record for most assists in a season from the 2005-06 season…With 89 points (20G, 69A), Wheeler is guaranteed to have better than a point per game this season for the second consecutive season…Wheeler has scored 20 goals or more in six consecutive seasons…During the past four seasons, Wheeler’s 237 assists are second most in the NHL. Kevin Hayes scored his first career overtime goal last night, as the Jets improved to 7-3 in games decided in overtime this season, including 3-0 on the road…Hayes became the fifth Jets player to score in overtime this season, joining Mark Scheifele (3), Bryan Little, Josh Morrissey, and Jacob Trouba. Winnipeg is 14-14-2 during the regular season when facing Minnesota since moving to Manitoba in 2011. The Jets have lost their last five regular season games to Minnesota. There have been seven winning streaks of three games or more in the all-time series between the two games, including five since 2015. The Jets are 9-for-31 (29.0%) on the power play in their past nine regular season games against the Wild and have at least one power play goal in seven of the nine games. Dustin Byfuglien leads all Minnesotans in career scoring against the Wild with 33 points (8G, 25A) in 41 games, while Blake Wheeler is second with 28 points (11G, 17A) in 34 games. Byfuglien and Blake Wheeler each have four career game-winning goals against the Wild. Five of Mathieu Perreault’s eight career goals against Minnesota have come on the power play. Blake Wheeler is an alumnus of the University of Minnesota Golden Gophers. Wild forward Eric Fehr played with the Jets during the 2011-12 season. Jets forward Matt Hendricks started the season with the Minnesota Wild before being acquired at the trade deadline for a seventh-round selection in the 2020 NHL Draft. Wheeler and the Wild’s Ryan Suter and Zach Parise competed at the 2014 Winter Olympics in Sochi as teammates representing USA, while Wheeler and Byfuglien played alongside Parise and Suter at the 2016 World Cup of Hockey. During his tenure as the head coach of the Carolina Hurricanes, Paul Maurice coached the Wild’s Eric Staal from 2003-04 and 2008-2012. Mathieu Perreault played under Wild’s head coach Bruce Boudreau during his time with the Washington Capitals from 2009-2012. Tyler Myers played with the Wild’s Marcus Foligno from 2011-2015 with the Buffalo Sabres. Mark Scheifele played with the Wild’s Matt Dumba at the 2016 IIHF World Championship for Team Canada.